While hiking in Chino Hills State Park this weekend, I spotted a piece of buried treasure. Well, sure, it was not exactly buried treasure, but when I saw this rusting a rotting ammo box splattered with crusty white paint nestled deep in the hills, an ancient World War II ammo cache came to mind. What I really found was a Geocache, a time capsule type thing. Geocaching, a relatively new adventure game, features hidden caches where people can broadcast hints or GPS coordinates to help other people find their booty. When you find the Geocache, you add your own flair into the cache and log a note. 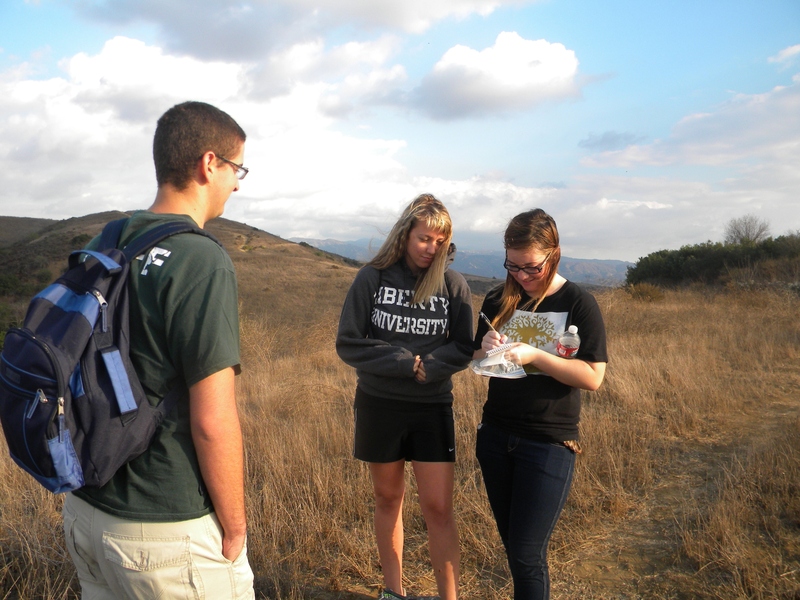 My group was on a hike to San Juan Hill in Chino Hills, a nearly 6-mile round-trip hike. We took a break on the top of a steep crest halfway in. I spotted a trampled makeshift path to the left of the trail, veering toward a hill overlooking the valley and told my three friends to wait as I explored. I just thought I would be getting a good view into the valley down below. Near the edge, there was a lone wooden pole, its remnants of barbed wire still jutting in several directions. I walked to this pole, at least a hundred yards off the trailhead, and at its base sat an upturned metal box. I could not open the latch at first. It had a complex two-part clasp on the side like a tackle box or a bear locker at Yosemite. Finally I opened it and glanced some papers. But I quickly closed it and ran to show my friends the treasure. We went through the papers and toys before one of my friends realized this was a Geocache. Sure enough, etched onto the side of the box was “GEOCACH” (the “e” was faded). There was a golf computer game CD, dinosaur erasers, a penny and some type of coin. My brother added his guitar pick. Knowing that a man found this spot just three days before us got me thinking: We are a group of people who are connected by finding a hidden spot 45 minutes into an intermediate hike in the hills in the northern most part of Orange County’s sprawl. Finding this Geocache has rekindled my sense of adventure. As a child, I always have longed for adventure. I would dig, play in the dirt and search for coins. I still collect letters and notes I find nudged into books or left on tables at my library job. But I am bogged down with responsibilities and do not have a chance to go out exploring much. “The mass of men lead lives of quiet desperation,” Henry David Thoreau said in Walden. I prefer earnestness. I want to find gold in these hills. 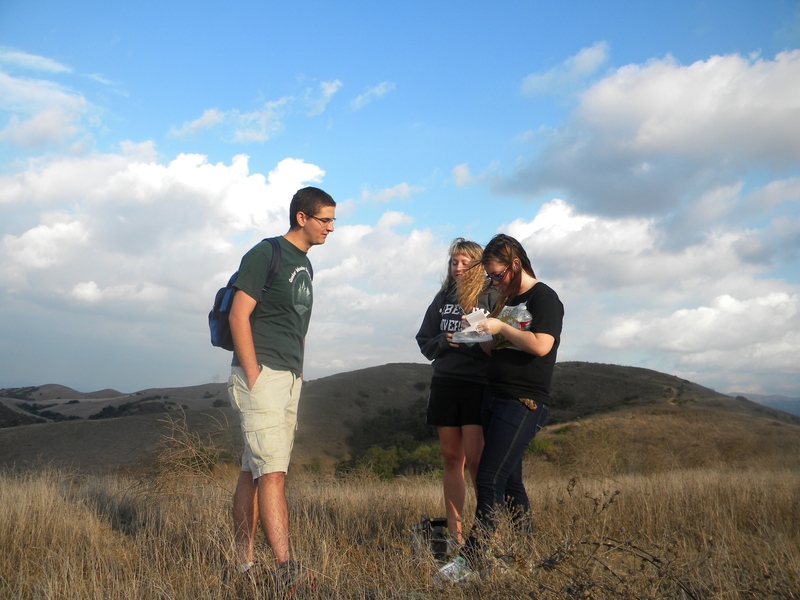 Writing our legacy into the geocache.